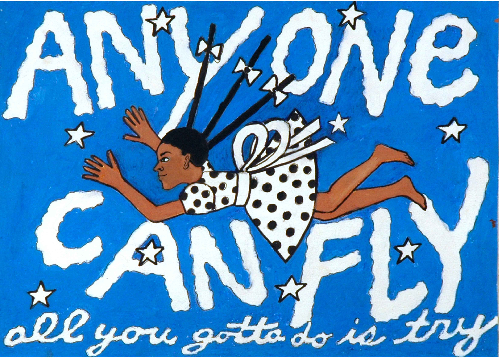 The Anyone Can Fly Foundation is dedicated to honoring great African American Artists. The garden party is the Anyone Can Fly Foundation's is held every June in Faith Ringgold's home and garden in Englewood, New Jersey. At the Garden Party, ACFF honors the annual Lifetime Achievement Award Recipient and a 'One of a kind Kid' award winner. Please join us! The Distinguished Artists & Scholars Lifetime Achievement Award. This award honors Master Artists and Scholars of the African Diaspora who have created a groundbreaking body of work that changed the course of art history. View a list of the distinguished artists we have honored. ACFF print fellowship began in 2006. This fellowship is offered to an artist that has not made a print edition. They work with the Experimental Printmaking Institute at Lafayette College to produce an edition of prints. The Anyone Can Fly Foundation’s One of a Kind Kid program selects a “One of a Kind Kid”each year and honors that child for his or her love of art, for being an independent thinker and for being a leader. Each “One of a Kind Kid” becomes a fellow and a member of the Anyone Can Fly Foundation family. The ACF foundation encourages them to recognize the importance of their imagination and creativity. As a fellow, the “One of a Kind Kids” are invited each year to the foundation events. View our honored children. Every October, ACFF hosts an evening of original works donated by friends of the foundation, as well as works by master artists including, Romare Bearden, Bob Blackburn, Margaret Burroughs, Will Barnett and Faith Ringgold. Join Us. Keep up to date with the work of the Anyone Can Fly Foundation and receive invitation to our event by joining our mailing list and following us on facebook.